The annual UNCWelcome Week event celebrates the culture of creative writing on campus and in the community. 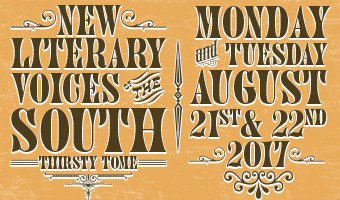 This year, Thirsty Tome is sponsored by Randall Library, the Department of Creative Writing, the Upperman African American Cultural Center, the Department of English and The Women's Studies and Resource Center. This year's program includes readings by literary powerhouses Stephanie Powell Watts (keynote speaker), Taylor Brown, Wiley Cash and Matthew Griffin. Their work focuses on the subversion of the Southern Gothic tradition, exploring the changing landscape of the South and its inhabitants. Watts' new novel, No One Is Coming to Save Us, was named one of the most anticipated books of 2017 by Entertainment Weekly, Nylon, Elle, Redbook, W Magazine and The Chicago Review of Books.